Promising to transform “scam Haryana to skill Haryana”, Prime Minister Narendra Modi asked the people of the state to elect a BJP government with clear majority, saying he wants to strengthen the state’s ties with Delhi to transform its fortunes. “I know that you are sad that Haryana is known as a state of scams. There are scams and then scams within scams. Our opponents are all involved in scams. Do you want a scam Haryana? I want to create a skill Haryana. You have to decide if you want a scam Haryana or a skill Haryana,” he said addressing a rally in Mahendergarh on Wednesday. Asking people to elect a BJP government that could lead the state on the path of speedy development, Modi lamented that in the last 25 years Haryana has not developed due to dynastic politics and questioned if the past elections or governments were run democratically. “You have to decide whether you want a Haryana free from corruption. Do you want to see Haryana freed from bahubalis (musclemen) and the corrupt? Then you will have to choose a new path. 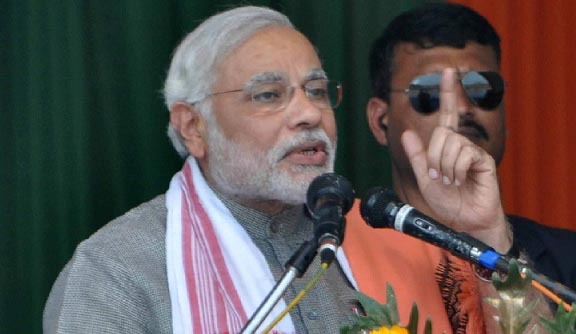 The only way left now is to elect a BJP government with full majority,” Modi said. Stressing on the importance of Centre-State ties and ‘Team India where the PM stood as a team with CMs, the Prime Minister said till now the Centre and the state stood next to each other but were not close enough and he wanted the two to stand with each other to create a force to reckon with.